is amon ra only few hundred mil there? But that's from jRO, and it seems like the base effect of the shoes were removed, and instead replaced with the proc enchant of the same type, while the rest of the system stays the same, maybe? The additional enchants may or may not be allowed, on top of the card slot (but the kRO screenshot suggests at the very least, card slot + basic enchants are possible). If the crystal frag looking thing is the +200 int proc, then GG magic-type fallen bishop shoes with +200 int proc! I'm pretty sure that's the int proc, yeah. I don't know anything else about it though. I got the screenshot from wiki. can someone from KRO verify the validity of theses statements? * 1 of Hervor and Jormungand will be given out to 1 guild master of an eligible guild per week. ** To be eligible for these items, a guild must have broke an emperium at least once during War of Emperium TE. ***** if this is true...''OP''!! so every week 1 guild master will recieve " BOTH " items? What determines that your guild master will get it over others? and how do you increase your guildmaster's chances of getting both items. What is the class requirement and level to play in woe te? will the emp take 1 dmg per hit as renewal emps? [ 8XX (base) + 7XX (weapon) + 7XX (weapon) * 0.4 (level weapon) ] * 1.5 * 2.05 * 1.47 = Shiroe's new total MATK when boots proc's. Edited by Mulder1, 15 May 2014 - 05:36 PM. It's unfortunate to see these listed with a lv99 3rd class minimum req. I want to use them on my TE MS! So you cant enchant and slot this boots? Please take my money now. and some skill changes like dragon breath damage reduced by thara frog and damage is affected by archer skeleton? my friend barvyn (my third favorite Canadian*; first favorite white canadian, though) poetically extols your merits and longs your return into his life as his, quote, "vibrant muse. ohhhh yEeEAaAaahhhhhhh." you are the pancakes to his maple syrup; the red to his leaf; the snow to his ground. and most of all, his blue buff at 7 minutes. ew its azyrk hi there! For those of you who are confused, You cannot slot this boots and have enchant on them yet because we're not getting Old Glast Heim Memorial Nightmare Mode(Hard Mode). Which is harder version catered to 160+. I think there are already enough information about enchants, and processes of making these, but it seems like people are still confused. Important: What we're getting is 1) Old Glast Heim Memorial Dungeon (Regular Mode) 2) Glast Heim Challenge Dungeon(just like Pyramid Challenge Dungeon). There are 5 stages of enchanting this boots. 1~3 consist of upgrading spell/ranged/atk/etc from lowest to highest. that will be your 1st slot enchant. .
For luck, it starts from 3->6. That will be first slot enchant. 1) Power of Bear, +200 str for 5 sec, procs when recieving physical damage.-500hp per sec while it last. 2) Eagle's Eye, +200 dex for 5 sec, procs when you're physically attacking. -50 sp per sec whitl it last. 3) Overflowing Magic, +200 int for 10 sec, procs when you're magically attacking. -200 sp per sec while it last. 4) Muscle Lover, +1000 item def for 5 sec, procs when recieving physical damage, -50% atk/matk while it last. 5) Light Speed, 193 aspd, +100 pdodge for 5 sec, procs when physically attacking. -400hp, -40sp per sec while it last. 6) Today is my lucky day, +200 luk for 5 sec, procs when physically attacking,recieving damage. no panelty. For 1st slot, 1st stage need 1 concentrated magic power stone, 2nd stage, you need 4 of them, 15 for 3rd stage, 30 for 4th stage. After reaching 4th stage with 1st slot, you can then try for 4th slot, which gives one of 6 enchant above. its random, and you need to use 10 of concentrated magic power stone. However, you can slot those boots by spending 5 concentraged magic power stone. but you wont be able to get hidden enchant on them. Which will require you to have corrupted concentrated magic power stone(comes with nightmare mod). TL;DR: To enchant slotted temporal boots of whatever, we need to get nightmare version of Old Glast Heim Memorial Dungeon(hard mode), and its most likely will not come with this particular update. May I ask that can we choose the enchant on the first slot independent from the type of the boots? For example, can I enchant Time-space boots of strength with spell enchant? Yes. for the 1st enchant slot, you can choose which enchant you want to put, and upgrade. Upon enchanting 1st slot, they will give you an option for your desired enchant. 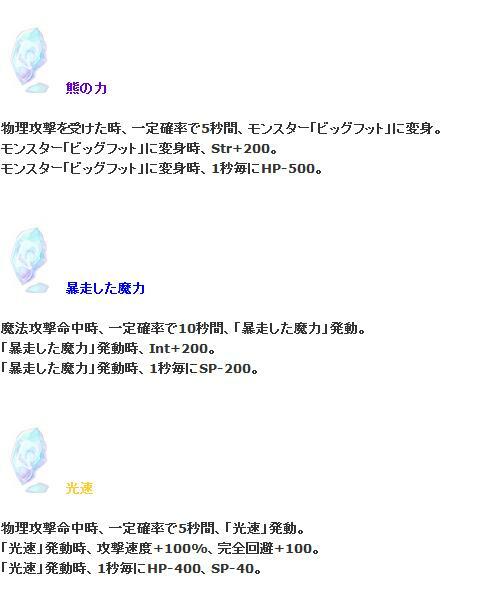 Then you will have to upgrade it till 4th stage, then you can try enchant for hidden enchant, which is random(meaning you can't choose this one). Edited by CharAznable, 17 May 2014 - 02:08 AM. you are the pancakes to his maple syrup; the red to his leaf; the snow to his ground. and most of all, his blue buff at 7 minutes. That was beautiful. You always strike me off guard as a talented wordsmith. We're still getting hidden enchant for non slotted temporal boots! no sadface! !